So, there are quite a few versions of hearts of palm ceviche floating around the blogosphere right now (YUM! 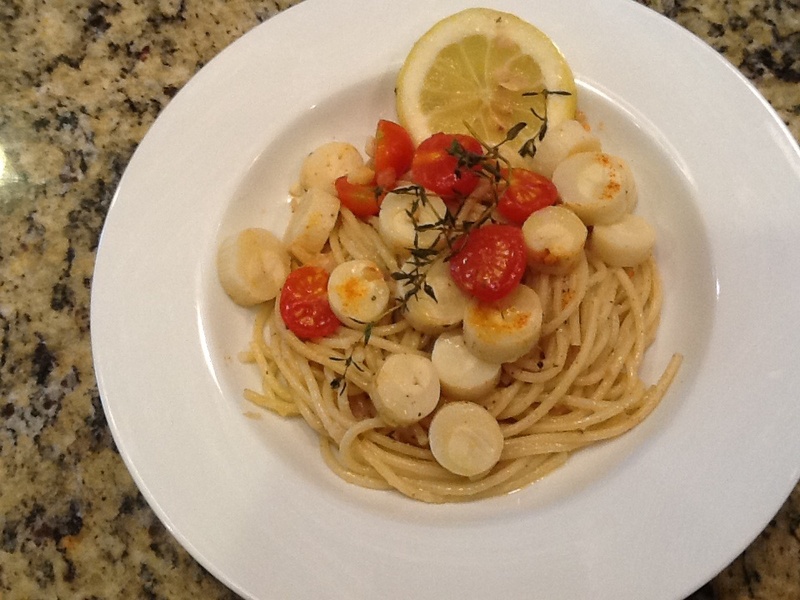 ), which got me thinking about what else one could do with hearts of palm. Seems to me they are a highly under-appreciated vegetable. If you haven’t had them (you probably have and just didn’t realize what those white things were in your salad), they taste a bit like a cross between very mild asparagus and artichoke with a luxurious silky, yet firm, texture. In ceviche they get treated sort of like mild white fish or scallops. 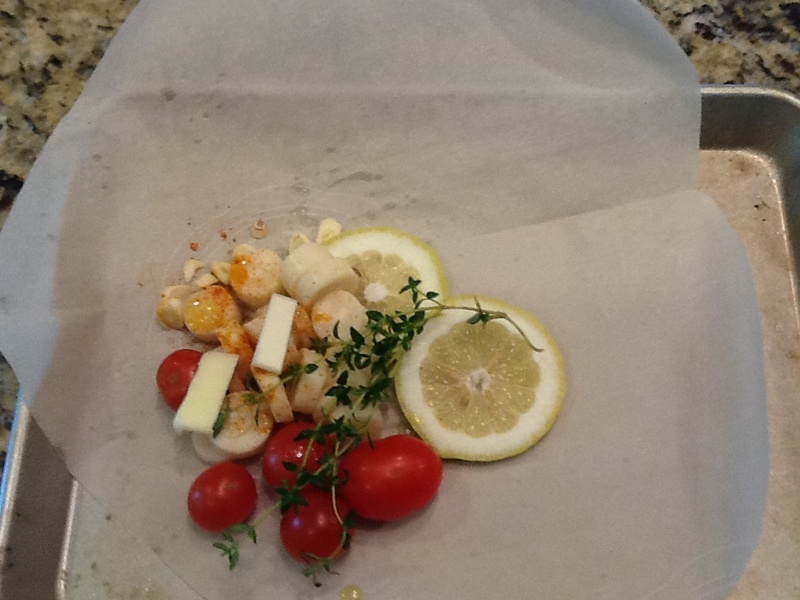 Anywho, it had been awhile since I had made anything en papillote and the seafoodish ceviche theme got me thinking that hearts of palm might also work kind of like scallops in that preparation too. Before I lose anyone, let me assure you that, despite it’s fancy Frenchy name, en papiollote is a very easy technique that ANYONE can do. pepper blend. Also known as peri peri or bere bere. cardamom. It’s not just hot, it’s peri peri hot. turmeric, cloves, Ceylon cinnamon and coriander. This is a bit confusing, since Wikipedia (the indisputable font of all knowledge) describes the spice blend as east-central African in origin and notes that the “constituent elements usually include chili peppers, garlic, ginger, dried basil, korarima, rue, ajwain or radhuni, nigella, and fenugreek.” Perhaps someone better-versed in the various cuisines of Africa than I can clear this up. This berbere stuff is heady, intoxicating really. But if you can’t get your hands on it, throw in a dash or two of cayenne with maybe a little smoked paprika (pimentón) to round things out. When the ingredients in the packet get cooking, they all mingle together and get all lemony and spicy and garlicky and buttery. Mmmmm buttery–but fresh, zippy and bright too. When you open up the parchment packet the steam from this bad boy is like the best aromatherapy ever. Each person gets their own packet, so if you make this for guests it makes for kind of a cool “tahdah” moment when everyone opens their’s up and gets a spicy garlic-lemon facial. Fold each sheet of parchment paper in half and then cut out a half-heart shape and unfold it to reveal a full heart (see elementary school did teach you something). Lay two hearts each on two baking sheets. (In the photo above there is only one parchment pack on a half-size baking sheet, because Andy was still in the hospital, so I just made one portion.) 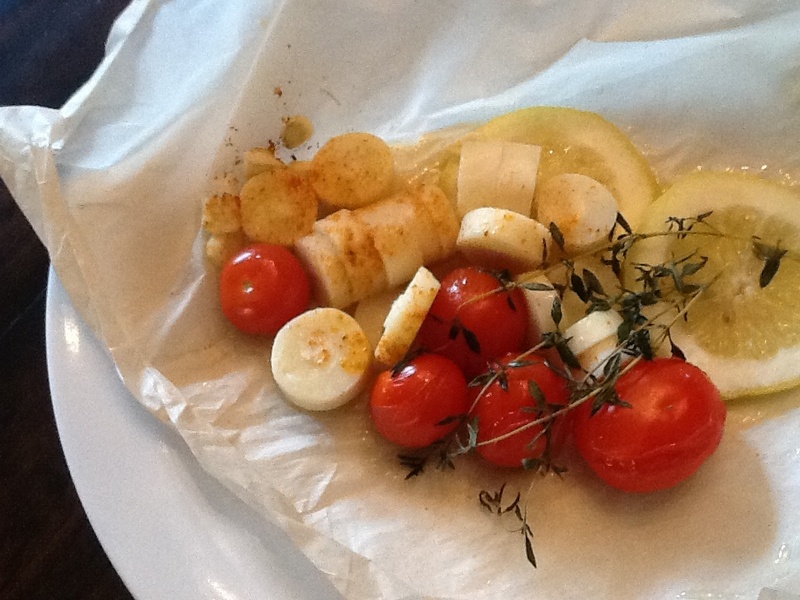 On half of each heart, neatly arrange a fourth of the hearts of palm, five tomatoes, a couple sprigs of thyme, a couple slices of lemon and a fourth of the garlic. Add a 1/2 tbsp. of butter to each parchment heart, drizzle with a little olive oil, sprinkle just a tiny bit of berbere and a little salt. 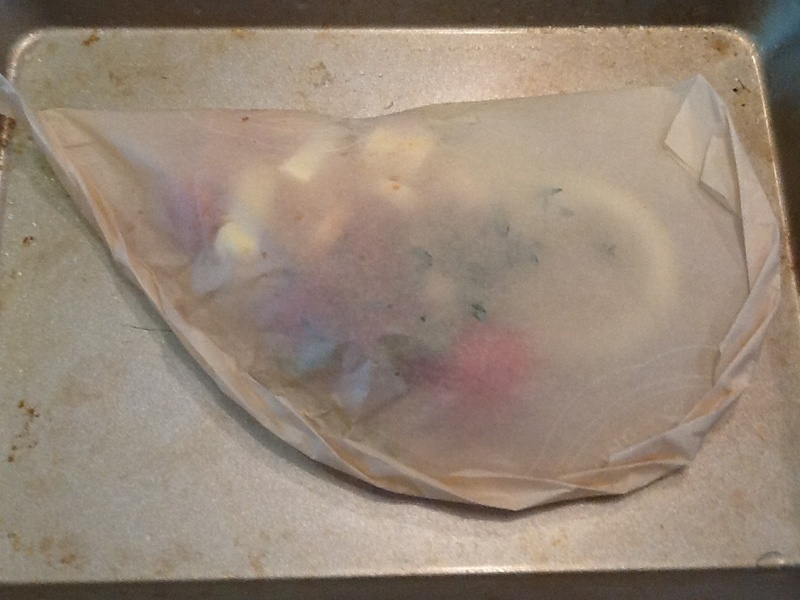 Fold the other half of the parchment hearts over the ingredients. Crimp them shut by starting with the top of each heart and folding along open side until you reach the bottom point of the heart. Gawd, I really do need a new camera. And some photogenic plates. Open slowly (but carefully to avoid a steam burn) and enjoy the wafting aromas. Eat these little parcels of love as a side; with some crusty bread (to sop up the spicy, lemony, garlicky butter); or with some pasta simply tossed with sautéed garlic, olive oil, lemon, parmigiano and pasta water.